When one hair ends its life cycle and fall off, a new hair replaces it. Nutritional deficiencies and stress are some of the common causes of hair loss. Dandruff and oily scalp can aggravate the condition. Along with a nutritious diet, daily exercise is required for healthy hair growth. Hair grows in phases and each hair has a life cycle that can last from a few years to a few months. In other words, all the hair does not fall out together, or grow together. When one hair ends its life cycle and fall off, a new hair replaces it. Of course, the replacement depends on various factors like age, hormonal changes, internal reasons and the general condition of the hair. The condition of the hair also depends on the state of internal health of both body and mind, as well as on external care. Diet is extremely important for the hair, because the hair is actually fed by the nutrients in the blood stream. Nutritional deficiencies and stress, along with dandruff and oily scalp are some of the common causes of hair loss. For healthy hair growth, the diet should supply the body with vitamins, minerals and enzymes, along with the required amount of proteins and other nutrients. The daily diet should include fresh fruits, raw salads, sprouts, leafy green vegetables, curd. Proteins can be obtained from beans, peas, dals, fish, lean meat, eggs, paneer and curd. Sprouted grains and cereals are of great benefit to the hair. If there is a problem of hair loss, ask your doctor to prescribe vitamin and mineral supplements. Along with a nutritious diet, daily exercise, relaxation, adequate sleep and a healthy lifestyle are required for healthy hair growth. Also, if there is a medical condition like diabetes, take your doctor's advice before making changes in your diet. A common question that is asked is how often the hair should be washed. The answer is that the frequency of shampoo should be according to hair type. Oily hair needs frequent shampoo. 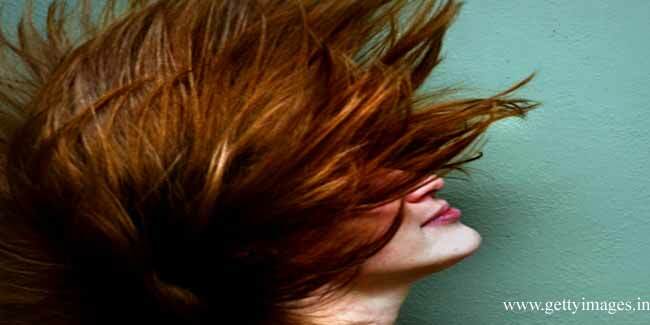 Generally speaking, three or four times a week for oily hair and twice a week for dry hair would suit most people. The important aspect to bear in mind is that washing does not harm the hair. What harms the hair is the product you use, as well as the quantity of shampoo that is used for each wash. Use a mild herbal shampoo and apply less. Rinse the hair thoroughly with water. For oily hair, a hair rinse is recommended. 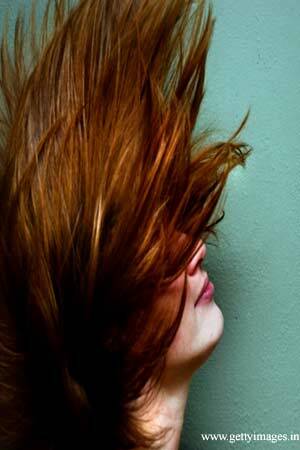 In fact, hair rinses also help to prevent dandruff. The application of oil with a light massage helps to stimulate blood circulation to the hair follicles. If there is dandruff, oil applications help to loosen dandruff flakes. Avoid vigorous massage of the head or rubbing of the hair. Apply warm oil on the hair and scalp. Using your finger tips, actually move the scalp in small rotary movements. Oils have their own particular properties and benefits. For example, olive oil is helpful in dandruff, as it restores the normal acid-alkaline balance of the scalp. Pure coconut oil is said to help hair growth. Ayurveda recommends the use of til oil, as it is said to restore "dosha" imbalances. Hot oil therapy is very useful, not only in dandruff, but for dry and damaged hair. Heat pure coconut oil, or sesame seed (til) oil or olive oil. Apply the oil on the scalp with cotton wool, rubbing gently to dislodge the flakes. Then dip a towel in hot water, squeeze out the water and wrap the hot towel around the head, like a turban. Keep it on for 5 minutes. Repeat the hot towel wrap 3 or 4 times. This helps the hair and scalp absorb the oil better. Repeat this three or four times. Leave the oil on overnight. Next morning, apply the juice of a lemon on the scalp and wash your hair after half an hour. Weekly henna treatments also help to keep the scalp clean and healthy. A healthy scalp grows healthy hair. Ayurvedic head massage is also said to encourage hair growth. Ayurveda recognises specific points, called "marma", on the body and head, where massage has specific benefits. It is believed that the flow of energy is along certain channels and the direction of the massage enhances the flow of energy. The "marma" points are massaged gently, using circular motions in a clockwise direction. Hair growth is not rocket science, just the right treatments would show excellent results.